Leiden was founded in the 12th century at the point where the rivers Rhine, Vliet and Mare merged. The city became an important trading center and expanded rapidly. 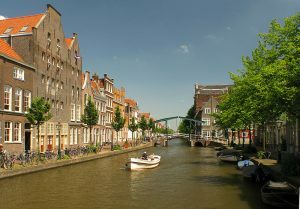 Canals we constructed to allow barges into the center of Leiden and thus a network of waterways and historical buildings developed, still present today. We will visit the Dutch National Museum of Antiquities, the national center of archaeology where you can admire cultures of ancient Egypt, the Near East, the classical world and the early Netherlands. Walking around Leiden, the city’s glorious history seems to come to life. The “Academie Gebouw”, ceremonial seat of the university, De Waag (the Weigh house), De Burcht (the Citadel), the stately mansions lining the famous Rapenburg canal, the beautiful Pieterskerk (church of Peter), the Hooglandse kerk (Highland church), and the 35 hofjes or almshouses in the city all tell the story of Leiden’s rich history.